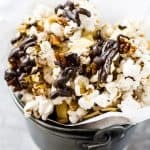 All the yummy flavors of caramel, chocolate, pecans, and coconut are found not only in a cake but in my German Chocolate Popcorn! Grab a medium to a large-sized pot with a lid. Put it on the stove on medium heat without the lid on. Add the coconut oil and three popcorn kernels. Cover and wait till all three kernels are popped. Once all three kernels are popped, remove them with some tongs and then add the rest of the kernels. Let them cook at medium heat, shaking the pot every three seconds or so to stir the popcorn around. Continue popping until you hear about 3 seconds of time pass between pops. Remove the pan from the heat. Add Image	Empty the popcorn into a large bowl. Sprinkle with one scoop of the Barleans Chocolate Silk Greens Powder. Set aside to cool completely while you prepare the rest of the ingredients. Let’s assemble the German Chocolate Popcorn! Spread your popcorn out onto a baking sheet. Melt the chocolate wafers in the microwave on medium heat in 30-second bursts until melted. While the chocolate is still melted, sprinkle on the toasted pecans, toasted coconut chips, and toffee bits. When all the chocolate is set, break up the popcorn into large pieces and store in an airtight container for up to a week. If it lasts that long. *You want an even layer of popcorn so we can get chocolate on as many popcorn kernels as possible when drizzling so spread it out. *I use a plastic bag or frosting bag with a tiny hole in it to get a small steady stream for drizzling. *You can put the pans of popcorn in the fridge to help the chocolate set up faster.